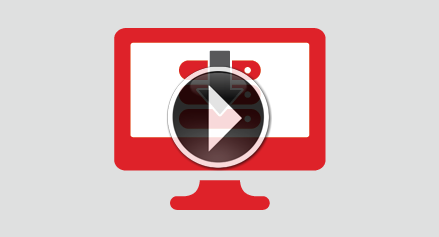 Watch the Video	Demo the Course Compiler now! Customizing courseware has just been taken to a whole new level. The Course Compiler is an amazing online tool that allows you to select sections from hundreds of courses and compile these into a unique course specific to your needs. We are trainers just like you and we know that one size does not fit all when it comes to your training plan. This revolutionary new online tool goes way beyond customizing an existing course; it gives you the power to create a whole new course, designed how you want it. 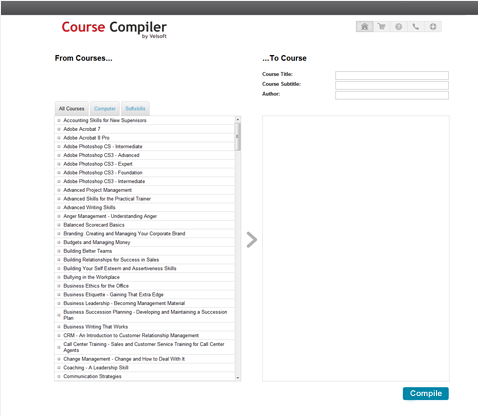 The Course Compiler is a very powerful tool with a very simple purpose; to allow you to find and select components from existing courses and easily turn these sections into your own course. Free to all Courseware Assurance customers, the Course Compiler automates a task that typically takes hours and hours and makes this an easy process. The first thing you will notice about the Course Compiler are the two sides of the interface. The left side represents the courses you will be pulling sections from and the right side is where you compile your course. The first step in the building process is to select your course of interest, which you will see expand to show all the sections found within this course. When you select a course section this automatically is added to the custom course you are building and can be now seen in the right-hand side of your screen. You can easily pull sections, from not only one course but from different courses, because the Course Compiler was designed for total flexibility in creating your unique course. After you’ve selected the sections you want to compile you have the ability to easily re-order the sections, remove them if necessary and add more. Once you have selected your sections and have the perfect course ready to compile, give your new course a cool title and add the author’s name… then hit the ‘Compile’ button. In minutes you have the perfect course built to your specifications, which is opened directly into Microsoft Word (or a compatible word processing program) for any additional touch-ups you may want to add. At this point you are done. Congratulations. Print out as many copies as you need for your next training class. Try the Course Compiler for yourself. "I did get a chance to go through the demo of the Compiler. What a great tool! I have done this myself the hard way, and this would make it so much easier. Thanks for always thinking of the trainers!"